Members of The Church of Jesus Christ of Latter-day Saints, sometimes erroneously called the Mormon Church, worship Jesus Christ as their Lord and Savior. Mormons believe that all things that have ever been created were created through and by Jesus Christ, and that His is the only name through which we may be saved. Latter-day Saints believe that He is the Only Begotten Son of God in the flesh, that He was born of a virgin, Mary, in Bethlehem, and that He suffered in Gethsemane and then was crucified, taking upon Himself the sins of all mankind, if they would only believe in Him and repent. Mormons believe that Christ was the first fruits of the resurrection and guaranteed the resurrection of all living things, a free gift to us. In fact, Mormon beliefs and the beliefs of most other sects of Christianity, even "traditional" Christianity, differ only on two important points — whether Jesus Christ was a created being, and whether a belief in the trinity — God, Christ, and the Holy Ghost being of the same substance and God being incorporeal — is necessary to be called a Christian. We don't know how many years the universe has existed. Perhaps billions, perhaps more; perhaps it has always existed in some form, but Mormon doctrine teaches that we all are eternal beings. We existed first as intelligences; then God the Father organized our spirits. We lived with Him as His spirit children in a pre-mortal realm for an unknown, but perhaps very long period of time. Mormon doctrine calls this our "first estate." As spirit-children of God, we had our agency to choose right from wrong. God revealed to us His plan for our salvation. His desire was for us to become more like Him. His plan is for our eternal progression, so it is often called the Plan of Progression, or God's Plan of Happiness. Mormon doctrine teaches that Jesus Christ is more intelligent than all the rest of us put together. He was the first organized of Heavenly Father's spirit children, but was and is eternal — He has always existed. God the Father probably organized the spirit of Christ eons before any others, since through Him all the worlds have been created. In the pre-mortal spirit realm Jesus Christ offered to become our Savior, as well as our creator. The plan of progression demanded that there be a time of testing, and that we take upon ourselves mortal bodies through which we could be tested. Mortality would be a time of learning, a time of trial, but also a time of forging eternal relationships with other people and forming families with eternal potential. God knew we would fall short of qualifying to return to His presence, since no unclean thing can dwell there. He knew we would sin, and He knew Adam and Eve would fall. To overcome the fall, to bring us the gift of resurrection and immortality, and to redeem us from our sins, Christ in the flesh would offer Himself a ransom. He would suffer the wrath of God for our sins, if we would only repent and believe in Him. According to Mormon belief and scriptural record, as well as modern revelation, there was another in the pre-mortal spirit realm who offered to be Heavenly Father's emissary. His name was Lucifer, and he was a powerful, charismatic spirit, whose pride nevertheless outstripped his intelligence. He stepped forward and offered a plan in which not one soul would be lost, but he wanted the glory for himself. He willfully rebelled against God. His plan not to lose one soul would either entail force, or placing heaven so obviously before our eyes that there would be no need for faith — no test, no error, no effort, no progress. This would have destroyed the agency so central to God's plan, and then God's entire plan to develop the divine spark within us. Lucifer was cast out with his angels — 1/3 the host of heaven. He became the devil and his minions who provide opposition on this earth. Opposition is tough, but it's necessary for the exercise of agency. There are some who say that Mormons believe that Jesus and Satan are brothers. From the above information about Mormon doctrine, one can see that we are all the spirit children of God, and spiritually, we are all related. The formulation of a catch phrase that not only diminishes, but reviles Mormon religion is underhanded. 2 Can We Become Like God? "Latter-day Saints reject the doctrines of the Trinity as taught by most Christian churches today. These creeds were canonized in the fourth and fifth centuries A.D. and do not reflect the thinking or beliefs of the New Testament church." These are the introductory sentences of an article written by Drs. Daniel Peterson and Stephen Ricks  regarding first century Christianity and the biblical view of God, Jesus Christ, and the Holy Ghost. Mormons call Jesus Christ Jehovah, the "God of the Old Testament." When God speaks in the Old Testament, it is most often the voice of the pre-mortal Christ. Mormons believe that God is One, as Jews recited in their shema. The Godhead is defined as one, opposing the pagan belief in many gods, each with a different purpose and often competing. Even Judaism has a place for ruach hakodesh, the holy ghost, and Jewish mysticism even proposes metatron, in essence, the doer of all God's will. 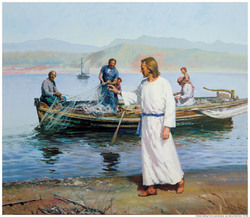 Mormons see three separate beings in the baptism of Jesus by John the Baptist, wherein the holy ghost descended as a dove, the voice of God was heard from heaven, and Christ was in the water; also at the crucifixion when the dying Christ addressed His father in the familiar, abba ("Daddy"), and in the vision of Stephen as he was martyred. Jesus Christ referred to and prayed to His Father often. The term "Christian" appears to have been first used for followers of Christ in Antioch (Acts 11:26). The word was probably devised by non-Christians. The idea of a trinity — three beings of one substance — evolved over centuries and was not formulated until the councils of bishops. The idea was never unanimous among followers of Christ or among leaders of orthodoxy. The idea that we can become like God, actually, that this is God's intent for us, is called theosis. It is not a new idea, but is found in the Bible and among most early Christian leaders and among many modern theologians (the idea going in and out of vogue in modern times in many Christian sects). "As even a cursory glance at early Christian thought reveals, the idea that man might become as God—known in Greek as theosis or theopoiesis—may be found virtually everywhere, from the New Testament through the writings of the first four centuries. Church members take seriously such passages as Psalm 82:6 [Ps. 82:6], John 10:33–36, and Philippians 2:5–6 [Philip. 2:5–6], in which a plurality of gods and the idea of becoming like God are mentioned." The idea of theosis shows that God loves His children. We are promised that we may become co-heirs with Christ. How much more can God give us? This does not diminish Christ in any way. He will remain our Creator and Savior. "The phrase 'Only Begotten Son' occurs with its variants at least ten times in the Book of Mormon, fourteen times in the Doctrine and Covenants, and nineteen times in the Pearl of Great Price. Basic to Latter-day Saint theology is the uniqueness of Jesus Christ as the Only Begotten Son of the Father in the flesh." The Book of Mormon record opens in 600 B.C., and in the beginning pages prophets see visions of the coming of Christ — His birth, death, and resurrection. From then on, the prophets in America leading a branch of Israelites predict the coming of Christ, and also teach of His redeeming grace. "And thou hast beheld in thy youth his glory; wherefore, thou art blessed even as they unto whom he shall minister in the flesh; for the Spirit is the same, yesterday, today, and forever. And the way is prepared from the fall of man, and salvation is free" (2 Nephi 2:4). "Wherefore, my beloved brethren, reconcile yourselves to the will of God, and not to the will of the devil and the flesh; and remember, after ye are reconciled unto God, that it is only in and through the grace of God that ye are saved" (2 Nephi 10:24). "And we talk of Christ, we rejoice in Christ, we preach of Christ, we prophesy of Christ, and we write according to our prophecies, that our children may know to what source they may look for a remission of their sins" (2 Nephi 25:26). Book of Mormon prophets prophesied of signs of Christ's birth and signs of His death. After His death and resurrection, Christ visited these people and taught them, and organized His church as He had in the Holy Land. Being more righteous than the Jews in Israel, Christ performed many miracles among these "other sheep," and the record of His visit is marvelous to read. "And when he had said these words, he wept, and the multitude bare record of it, and he took their little children, one by one, and blessed them, and prayed unto the Father for them. And when he had done this he wept again; And he spake unto the multitude, and said unto them: Behold your little ones. And as they looked to behold they cast their eyes towards heaven, and they saw the heavens open, and they saw angels descending out of heaven as it were in the midst of fire; and they came down and encircled those little ones about, and they were encircled about with fire; and the angels did minister unto them" (3 Nephi 17:21-24). "And it came to pass that he did teach and minister unto the children of the multitude of whom hath been spoken, and he did loose their tongues, and they did speak unto their fathers great and marvelous things, even greater than he had revealed unto the people; and he loosed their tongues that they could utter" (3 Nephi 26:14). Jesus Christ witnessed to these people of His birth, death, and resurrection. 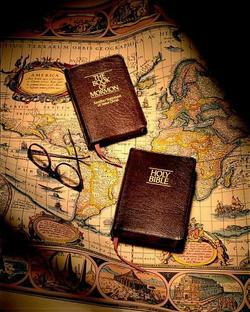 The Book of Mormon is a second testament of Jesus Christ. ↑ Cited by Bill Forrest, “Are Mormons Christians?” Mormon Miscellaneous Response Series (Salt Lake City: Mormon Miscellaneous, n.d.). ↑ The Spirit of Eastern Christendom, p. 10. This page was last edited on 20 December 2013, at 16:15.